This box is a companion piece for the Kensington square Box. It is the same size - 8 cms high, 17.5 cms wide and 11.5 cms deep - and has similar design features. 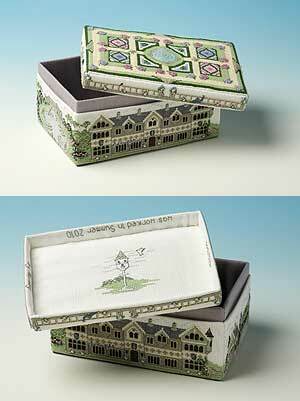 The cross stitching is worked on 16-count antique white aida, and the box has a dark green base and is lined with light grey evenweave fabric. The pictures around the sides represent the house and grounds of a country estate, showing the front and back views of the house, the gate and gate lodge and the water feature in the garden. Rhododendrons are blooming around the house and their bright colours are also found in the formal garden worked on the lid. Inside the lid a corner of the garden is shown, with a dovecote and fluttering dove, and personal details may be worked inside the lid rim if you wish.